Directions : 18 miles north of Denver, 1.5 miles west of HWY 85 on 124th Ave. TERMS & CONDITIONS: Cash, Checks (with proper ID) All checks will be run through Credit Check. All returned checks will be on display in our office. Credit cards accepted; VISA, MasterCard, Discover, 3% handling fee. No items shall be removed until payment is received. Everything is sold "AS IS" and "WHERE IS" Please inspect before you buy. 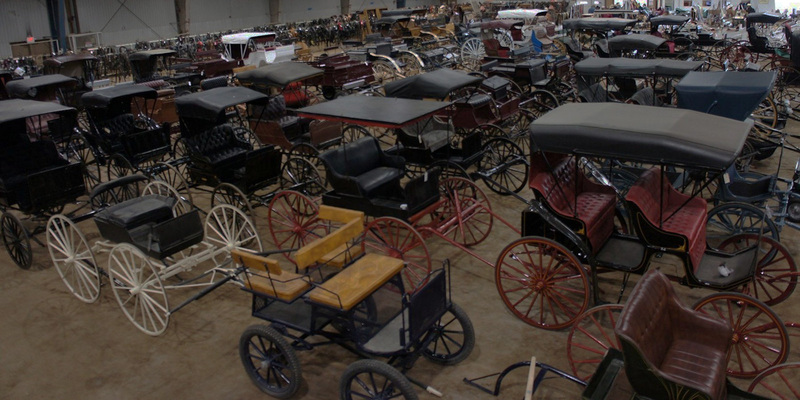 AUCTIONEER'S NOTES: Yes, the auction is on for July 8 & 9, 2011 and the ban has been lifted at the fairgrounds. Everything is ok.
(Dillon) 10 yr. old gelding well broke to drive & ride. Beginner horse. Another photo of Dillon showen under saddle. (Pat & Gin) 4 & 5 yr. old team of full sisters. Well broke & gentle. 12 & 14 yr. old geldings broke to drive. Used for pulling and farming. 10 yr. old black gelding broke to drive & ride. 6 yr. old black mare broke to drive & ride. (Peanut) 16 yr. old gelding broke to drive & ride. (Jack)10 yr. old brown & white gelding broke to ride & drive. (Apache)7 yr. old grey gelding broke to ride. Great, reliable trail horse. (Mindy) 10 yr. old blonde mare broke to drive. 5 yr. old mare broke to drive & ride. Another photo of the cross mare in harness. (Jack & Jill) 3 yr. old 14.2hh Belgian john & molly mules. Broke to drive & ride. Very quiet & traffic safe. Coming from an Amish farm. 5 yr. old sorrel john broke to ride. (Ike & Scoop) Team of 16.3hh Belgian mules broke to drive & ride. Traffic safe and real gentle. Coming from an Amish Farm. 10 yr. old sorrel john broke to drive & ride. (Misty) A real baby sitter. Grandkids have out grown her. She is broke to ride & drive. Misty shown driving in the cart. 12 yr. old blonde molly and jack broke to drive to all farm equipment and pack. 9 yr. old well trained youth Western horse. Good trail & mtn. horse. Neck reins. (Maggie) 6 yr. old great barrel & pole horse. (Blaze) 6 yr. old 14.1hh gelding well broke & very quiet. Would make an excellent youth pleasure horse. (Pistol) 4 yr. old 14.1hh fancy gelding kid broke. Yearling & 2 yr. old grulla brothers. (Lady) 10 yr. old big stout mare broke to ride. Will go all day. Very nice. (Reba) 6 yr. old mare well broke to ride & drive. Very sharp & quiet. (Howe) 5 yr. old broke for anyone to ride. Very quiet. (JJ)9 yr. old grey gelding broke to ride. (Bailey) 6 yr. old broke to ride. (Caddie) 5 yr. old broke to ride. (Sandy) 4 yr. old broke to drive & ride. Would make a good 4-H project. (Platinum) 5 yr. old palomino gelding broke to ride & drive. (Buck) 10 yr. old gelding broke to ride & drive. (Laser) 3 yr. old gelding broke to ride & drive. (Blinking Jay Bar) 16 yr. old QH gelding broke to ride. (Flying R Tamy) 11 yr. old QH mare broke to ride. (Jim) 4 yr. old stands 16hh great trail and family horse. (Kota) 8 yr. old broke to ride> Been on lots of trail rides and has great ground manners. (Diego) Has 45 days professional training. Crosses water and does good on trails. (Sunny) Honest, reliable Palamino done many miles on the trail. Finished head & heel horse. (Harley) This mare is a nice using horse. She is reg. and bred for cutting. (Snip & Snap) Team of 6 & 7 yr. old mare & gelding kid broke. Broke to drive & ride. Very sharp & well matched 13.1hh. (Molly & Missy) 3 yr. old team broke to drive & ride. Will also drive sgl. Amish kid has been driving them. (Trixie) 12 yr. old 55" mare broke to drive & ride. (Bella) 7 yr. old 46" mare broke to drive & ride. Very sharp & a real babysitter. (Rocket) 5 yr. old 40" broke to drive & ride. Kid's pony. Another photo of Rocket performing one of his tricks. 11 yr. old white mare broke to ride & drive. (Smokey) 7 yr. old broke to drive & ride. (Snowball) 5 yr. old broke to drive & ride. (Daisy) 7 yr. old sorrel mare broke to drive & ride. (Sparky) 8 yr. old broke to drive & ride. (Misty) 5 yr. old sorrel mare broke to drive & ride. A real babysitter. (Domino)5 yr. old gelding broke to ride & drive. Surrey has brakes, auto top, trunk. Built by Martin Buggy Shop. Nice orginal surrey. Built by John Deere Plow Co.
Nice orginal buggy built by John H Clark Co.
Includes pole and 2 sets of shafts. Nice unit w/hyd. brakes. Carriage has brakes & auto top. New carriage w/brakes & auto top. Vis built by Martin Buggy Shop. Built by Martin Buggy Shop. New wagonette built by Martin Buggy Shop. Sleigh built by Martin Buggy Shop. Built by Ingalls, Wyer & Co, Boston, Mass. Sleigh was restored in 1989. Black & blue horse size cart. Built by Martin Buggy Shop. Natural finish cart built by Martin Buggy Shop. We will have a mini cart like this painted black. Built by Martin Buggy Shop. Horse size cart built by Martin Buggy Shop.